Overlocking with instant success! Learn more about the bernette 610D overlocker by Bernina and test drive it now at your dealer. You'll be impressed by the wide range of stitch types and the many convenient features the Bernette 610D provides. Black Friday Sale Nov 15-30 ONE FLOOR MODEL LEFT! Whether you're sewing soft furnishings for your home or clothes, this overlocker will make all your projects successful. The bernette 610D includes a wide range of convincing features that make it easy to use and the very attractive price makes it especially suitable for beginners. The swing-out free-arm front makes threading a cinch. Stitch length, thread tension and differential feed can be easily adjusted, and colour coded markings help you find your way. 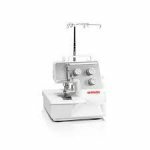 The bernette 610D overlocker helps you achieve instant success with your projects!